I’ll admit it, I’m a complete and total java junkie. I love curling up with a good book and a cup of coffee. Around here, every time Coffee Butter has to be packed, there is a small race in the warehouse as soon as people realize that the Coffee Butter is up again. I don’t blame them. I love packing it myself just for the amazing scent. Since I’m such a junkie, I thought I might as well share my addiction in a cream so yummy that I think it has been hanging out at the local coffee shop! The things we will need to make this drool-worthy Coffee Butter Latte Cream are listed below. We are making the regular recipe and a light version of the recipe. The fun part of testing a recipe with slight changes is that we can compare finished products. It is amazing how much slight changes in formulation will cause major differences in the finished product. The original recipe is heavier and more like a durable gardening cream. The lighter version is smoother and silkier. Both look liked whipped cream in a jar! If the waxiness of the cream is too much and you want less of a gardening-type cream, reduce the Stearic Acid by up to half. 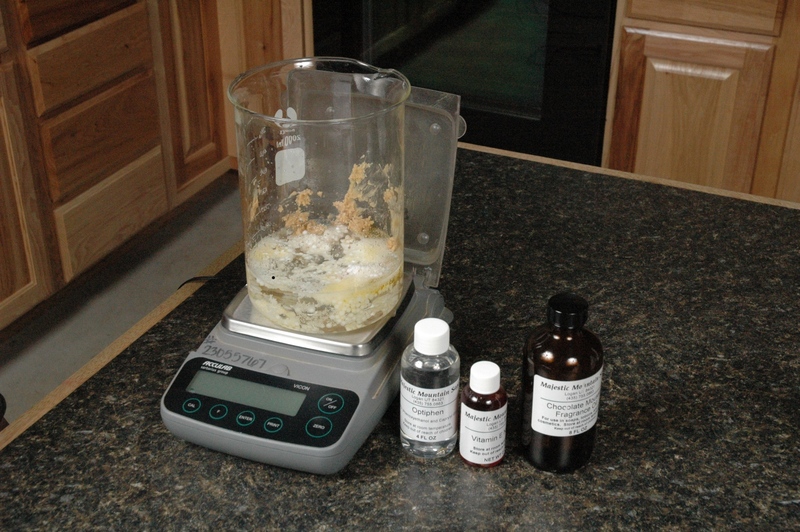 Each reduction will cause changes in the final cream, and you will want a test batch of each to compare. We try for initial test batches of 100 grams if you want to do some playing. Above all, keep good notes for your comparison tests, you will find that slight changes can make a cream go from just okay to WOWIE-ZOWIE! Place the beaker on the scale and then tare the scale. 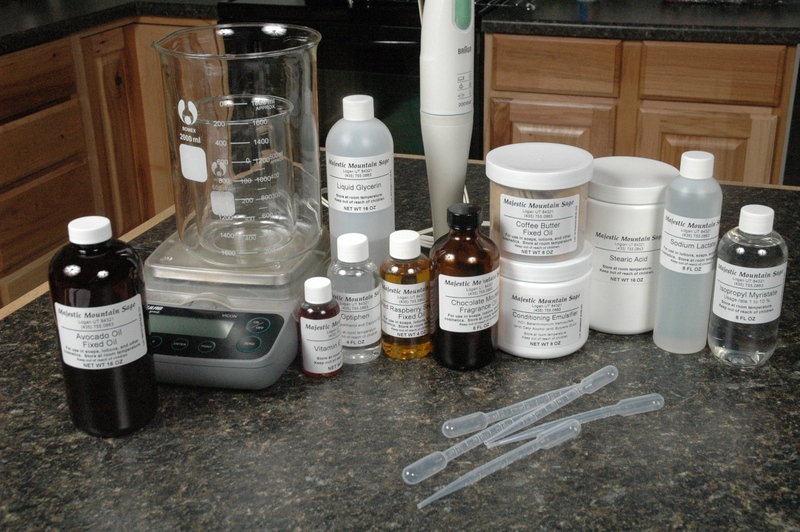 Measure all ingredients into the beaker except the Vitamin E Natural, Optiphen, and Chocolate Mousse Fragrance Oil. We will add these ingredients when the mixture has cooled. Microwave to heat the primary ingredients in the beaker. 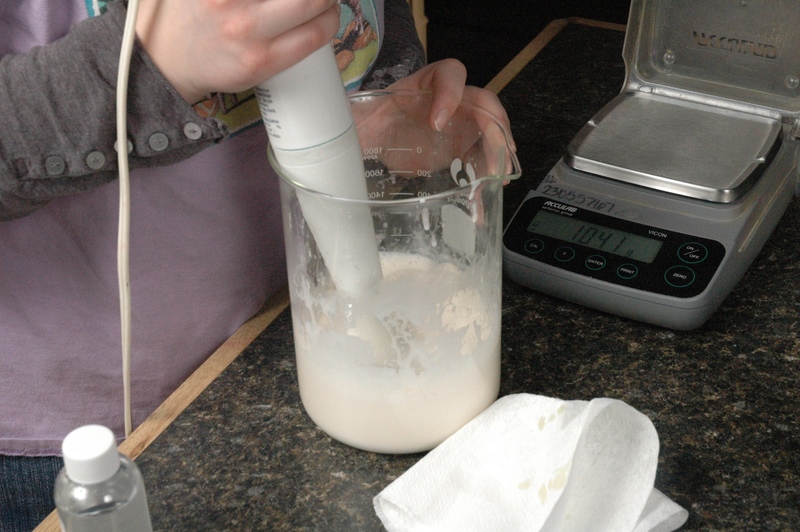 Using the immersion blender, pulse until mixture is emulsified. Once blended, let the mixture cool until it starts to thicken. Now we can add the Vitamin E Natural, Optiphen and Chocolate Mousse Fragrance Oil. After all ingredients are mixed, we can pour into the containers of our choice. If you receive samples from this post, you will receive one sample of the regular batch and one sample of the light batch. Test to see which one you prefer, then send in your comments. I made this batch a total of 5 times. The first time I made the original recipe to test my understanding of the project and used the experience to help write my blog text. The second time I made the original recipe with no changes, this was to get photos to be in the blog. The third time I made it, I was going to make the light version, but I followed the original recipe again! After that, I figured I’d be smart and just double the light version of the recipe for my fourth attempt. This would help me have an even number of samples. However, I made one tiny mistake when I forgot to check my math. I forgot to double my water! At this point I was very frustrated with myself, and I decided to write out the recipe step by step. Yippee! Success at last! The moral of this story is to check your math and make sure you don’t make silly mistakes. I will be sending samples of my half water – whoops version. You can laugh along with my mistake. Who knows! You might decide you like this version the best. Need ideas for spa related gifts for yourself and your friends? Next week’s blog will focus on spa gifts you can make. March 10, 2009 Edit: I’ve had some people sending me messages about the recipe for this cream, and since we seem to be having some issues with the link at the top I would add the the complete address here. http://www.thesage.com/recipes/recipes.php?.State=Display&id=190 I hope this works for you! Weigh ingredients except for Vitamin E, Optiphen and Chocolate Mousse. After microwaving, blend with immersion blender. Blending after adding the Vitamin E, Optiphen, and Chocolate Mousse. Coffee and lotions and creams, Oh my! It sounds good enough to eat!!! Isopropyl Myristate? What is that? To quote our catalog, “This wonderful additive is used to reduce the greasy feeling in lotions and creams. IPM can also be used in lip balms and lotion bars. In lotions this product is considered a dry effect emollient to the skin.” I’ve also forwarded your question on to Technical Support to see if they can help you. I just received three samples of the Coffee Butter Latte Cream and thought I’d let you know what I think. First the one I like to most of the three is the regular cream. The Whoops and Light feel a little too greasy for my taste. I really like the texture of the regular cream as it reminded me of whipping cream and absorbed nicely into my skin without leaving anything behind other that soft skin and scent. I liked the scent at first because it did remind me of a wonderful cup of coffee. But, in all three samples, the scent is just a bit too strong for me and my customers. Most of the people that purchase my lotions prefer a lighter scented lotion and like their candles and air fresheners to be scented as strong as this. I only tried a very small smount on my arms and I’m starting to get a headache from the scent. I’ll probably have to wash it away in a few minutes. I am thinking that this coffee butter would be really terrific in a lip balm with just a bit of Sugar Kisses to sweeten it up. Or, how about a mixture of coffee butter with cocoa butter – a mocha latte lip balm? Have fun playing with the Coffee Butter. You can also lighten the scent of the cream by using less fragrance oil. I love these! I received all three samples and I have to say that I love the regular cream the best. It just feels silkier. The scent is perfect. Very light and not overpowering. This is a keeper. Ok, this has nothing to do with this particular recipe, but I figured it belonged in a lotion/butter post. I’ve always been a lotion freak, can’t stand the feeling of my hands after they get wet/washed and dried. Lately, I’ve had issues with scads of different lotions, creams, etc for hands. That’s why I started making my own, figured store bought stuff just wasn’t gonna be what I’m looking for. So far Ive struck out. Sorry for the long back story. Most people like a soft “powdery” feeling after the lotion soaks in. Me, can’t stand that 😉 I’m desperate for a lotion that doesn’t leave that feeling after soaking in, but isn’t massively greasy as well. Does anyone have any ideas on a recipe or have a recipe they can share? Avoid lotions that have cyclomethicone or dimethicone in them. Also, if you don’t have a water softener then I would advise one. The washing hands thing sounds like hard water and it makes your hands feel dry and cracked. A water softener and a liquid soap with good humectants are crucial. A lotion that has Hydrovance is probably something you would like. I have been making a whipped olive oil cream and it is a little difficult to put in a bottle. I will put balm in a jar and lotion in a bottle, but what about a whipped cream, should it go in a bottle or jar? It is easier to put in a jar, I just thought it would stay cleaner using from a bottle. What do you think, is one better than the other, or is it just individual preference? I would try a Grand Oval bottle if you are concerned about bacteria and yeast. Personally, I prefer a jar for whipped body butters and creams. I think most of the packaging comes from personal choice and easy access. For example, if you bought a whipped body cream at the store, you would find it in a jar for ease of packaging and consumer access. If you are making the cream for yourself, then choose a container that you enjoy. If you are making it to sell, I would recommend a jar. You can use a pastry bag or zip style bag to fill either bottles or jars, so that might help you with the filling. As long as you use a preservative of some type in your cream, then I don’t think there should be any issues with any yucky things growing in your cream. Think I will give the jars a try, seems to make more sense. I have some of your 4oz low profile jars, good size to practice with. I recently purchased the body butter kit that you sell. I don’t want to make the entire container at once. I only want to do about 10 jars with the fragrance oil that came in the kit. How do I determine how much fragrance oil to use for a smaller batch? I’m guessing that since it is about 1/3 of the butter base, I would use 1/3 of the fragrance oil but I wanted to make sure I didn’t mess it up. You are correct. You will use 10 mL to scent the smaller batch. Each 1 fl oz bottle of fragrance oil contains about 30 mL and if you divide that into 3, you get the 10 mL I recommended. 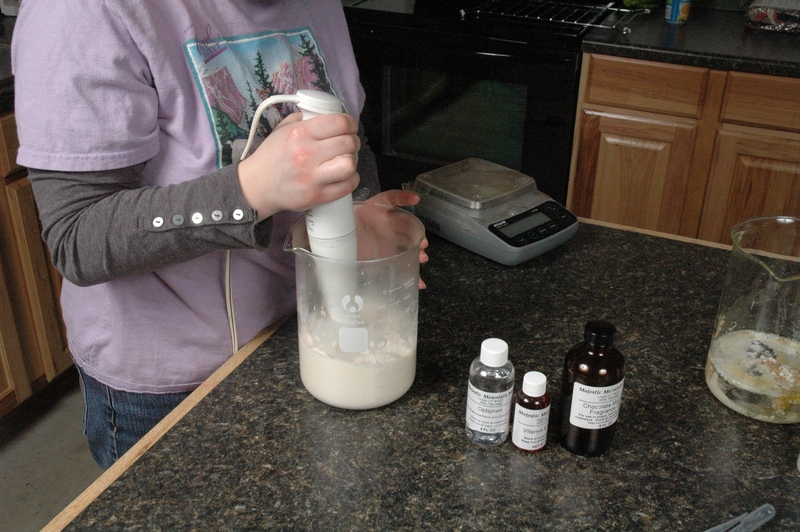 I make a lotion that has wheat germ in it but its scent if overpowering it. Does anyone know of anything that I can substitute for the wheat germ? Wheat germ can do this. Reduce the wheat germ to 5% or less of your recipe so you can use up what you have. You might be in the 3% range and be happiest. Then use sunflower and avocado oil as a replacement. 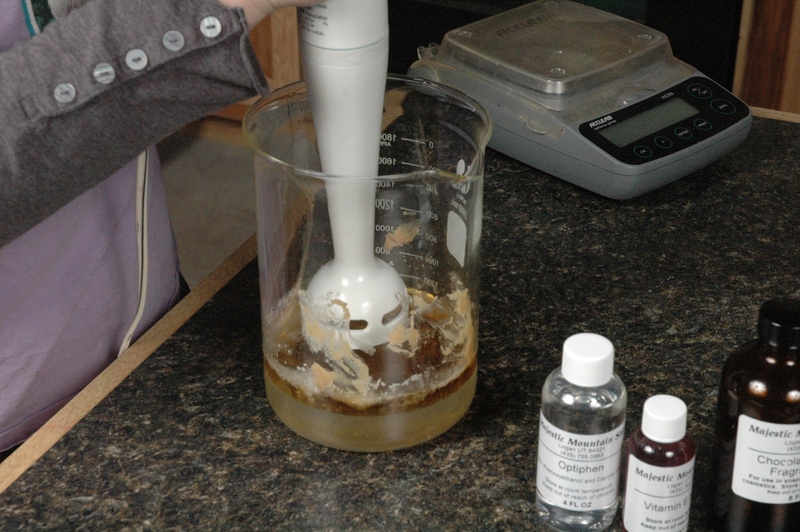 I chose both of these to simulate the viscosity of wheat germ and keep your costs down. Use about 1/2 sunflower and 1/2 avocado oil as the replacement for wheat germ. I think you will like the lighter scent much better.